Welcome! Well, it’s been a few weeks since my last Colour Me challenge post. I’m back in the game and sharing my first Christmas card of 2015. This week the challenge is to create a project that incorporates red, green, orange, and yellow. I have a how-to video to share to show you how I made my card. You can watch the video below, or on my YouTube channel. 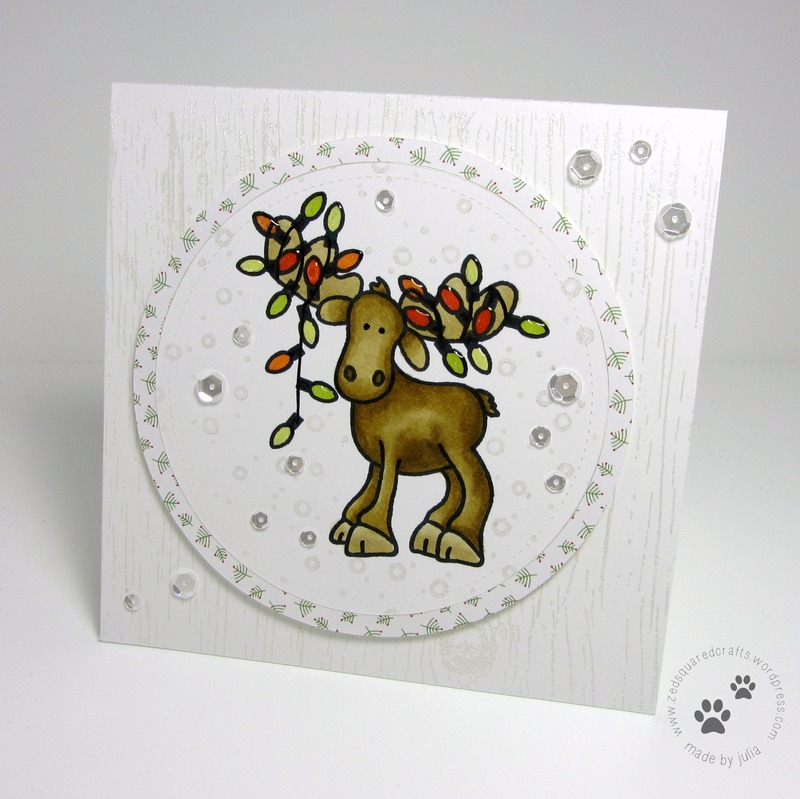 The Alley Way Stamps stamp set that I used includes the moose, as well as several different decorations. I used my Spectrum Noir alcohol markers to colour in my moose. To get him all tangled in the lights, I used to fine tip marker to draw the cord, and then used the light bulb stamp to stamp the lights onto the cord. I went back in afterward to colour in each bulb using the challenge colours. Of course, I had to add a little clear Wink of Stella glitter and Glossy Accents to complete the string of lights. That’s it for today. Thanks so much for dropping by. I hope to see you playing along at the challenge. Ever so cute, Julia! So funny we were thinking along the same wavelength ;). Love the glossy accents addition to your lights and your mix of woodgrain and little trees prints!